Both priests at St. Monica and St. James will hear Confession from you. All who have contrite hearts and do truly and honestly repent and turn to God, the priests will absolve of sin. The power to forgive sins was given to the Church by our risen Lord on the first evening of Easter: "Jesus breathed on the disciples, and said to them,'Receive the Holy Spirit. If you forgive the sins of any, they are forgiven; if you retain the sins of any, they are retained.'" (John 20:22-23) At the heart of the Gospel is the call to repentence, the call to turn from sin and toward God. (Mark 1:14-15) In the Sacrament of Reconcilliation, we have the means for forgiveness of sin committed after Baptism. 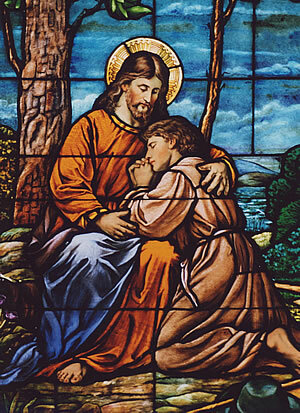 Confession and the granting of God's forgiveness, or Absolution, not only gives us, but also compels us to seek a new and enriched relationship with the Savior of the world, with our neighbors, and with ourselves. By our penance, we enter into the joy of our Lord.